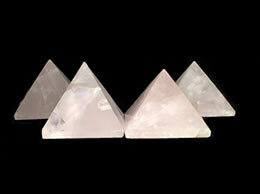 Beautiful Rose quartz pyramids different sizes handcrafted from natural Rose quartz mined from mother earth. 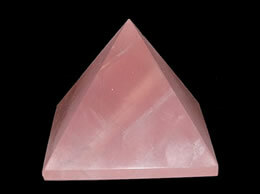 Rose quartz pyramids when kept in home and offices radiates lots of loving energy. This beautiful stone opens up the heart chakra relieves stress, brings peace and calm the emotions Rose Quartz is a stone for love and harmony it teaches us to love ourselves and others and live in harmony with the nature, thus opening us up to universal love; heals emotional wounds and gives comfort; helps us to overcome grief. It is the stone of love that adds positive energy to relationships. The stone is also believed to replace negativity with harmony and invoke compassion and forgiveness. It relieves a person of stress and calms the anger. 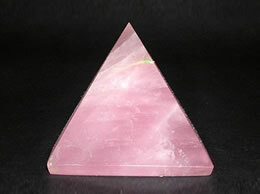 For wholesale and bulk rose quartz pyramid product inquiries do contact us. Size – 42 mm, Weight – 60 Gms. Approximate Size – 43 mm to 45 mm, Weight – 75 to 85 grams.